PATTAYA:--Beach Road will be closed from 6 a.m. to 7 p.m. April 19 for the finale of Pattaya’s Songkran celebration. 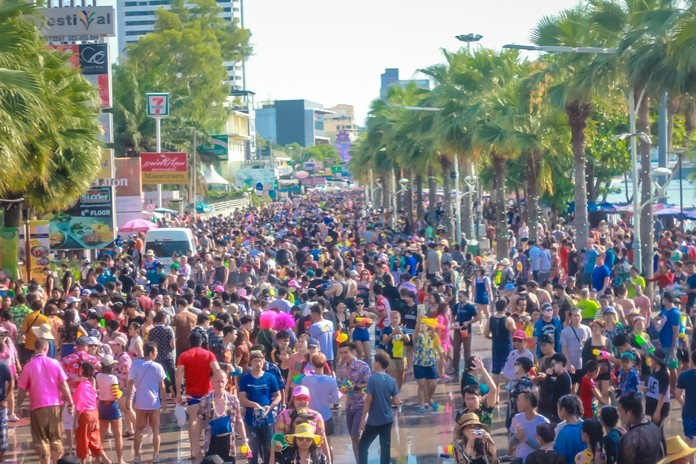 Deputy Mayor Banlue Kullavanijaya said at an April 10 planning meeting that the epicenter for Pattaya’s annual “wan lai” water-throwing melee will become a walking street for the day, with tens of thousands of people expected to celebrate the Thai New Year along the shoreline. Sidestreets leading to Beach Road will also be closes to traffic. Second Road will be as normal, but likely gridlocked like nearly all of Pattaya’s streets that day. Police and support volunteers will be stationed around the party zone to keep things from getting too rowdy and lend aid to those overcome with partying. Probably a good thing while all the foolery continues as getting jetted or water slung over you when on a bike or in a bahtbus ain't no joy and in the case of motorcyclists getting squirted with icy water can be downright dangerous .. But then acting like grown ups ain't one of the defining national characteristics .. Worst holiday ever. EVER. People really do get thrown off their motorbikes by idiots throwing water into their faces. This really happens. I know one guy on this forum who lost a leg in such a crash. My first songkran, I was laying low in Jomtien. I ran on the beach and was walking home when all of a sudden a bucket of water and baby powder got me right in the face. When I opened my eyes, some fat little gay thai guy was giggling, so happy to get me hard in the face. I chased him back into his shop. I'm glad I didnt catch him and that discretion got the better of me. I can still see his ugly gay giggling face. Always a great festive time along Beach Rd when it’s closed off for the gala event...smiles and happiness everywhere. I only wish this resort town with “no rules” would limit the wasting of water throwing to one DAY- not one week. the festivities have got out of hand big time. It is just a stupid time of year, where all Thais think that every other person likes TO GET WET.....and I AM NOT ONE OF THEM.....if I want to get wet I go in the pool or the sea !!! Yeah right. For your information, Songkran finished yesterday. Not in Pattaya it doesn't. 19th is the "big wsterfight" day. Exactly, it's "the big water fighting day". Nothing to do with Songkran. You are exactly right. Songkran is officially over, however in Pattaya the ensuing greed and stupidity is unfortunately not over. Not a good look you chasing a little ugly Fat gay guy, what would your neighbors think? Still 3 days to go 19th is the last day.